The economic crisis in Spain produced the cease and abandonment of aspiring and outstanding facilities conceived to fulfill amusement luxury during those happy years of wellbeing and abundance. The aspiring restoration of the old Balneario of Panticosa, located on the heart of the Spanish Pyrenees, and its transformation into a luxurious and modern tourist resort was suddenly vanished, producing for example the closure of the Gran Hotel designed by Rafael Moneo, the cessation of the construction —at its very ending stage— of the High-Performance Sports Center designed by Alvaro Siza or the abandonment of an impressive parking building anchored to the mountain. 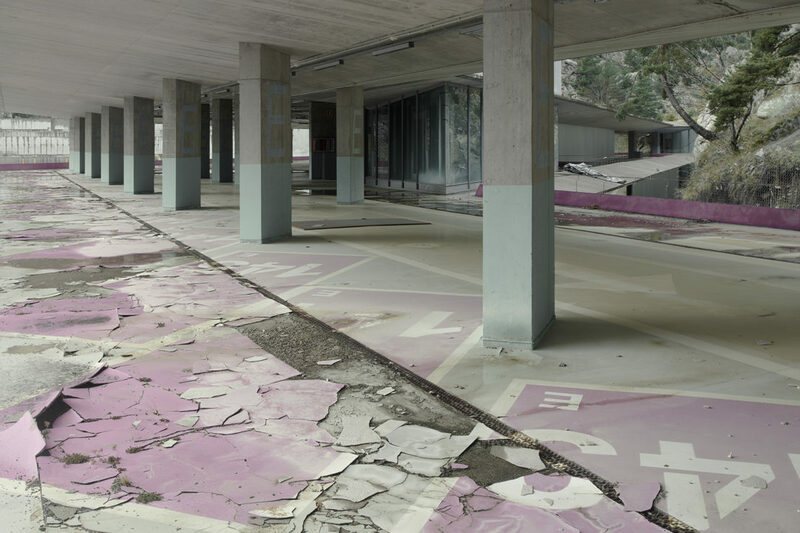 The images of this last facility selected for the Venice exhibition faithfully depict this sad reality and suggest a totally different visual narrative of the architectural space and its unexpected ruinous condition.